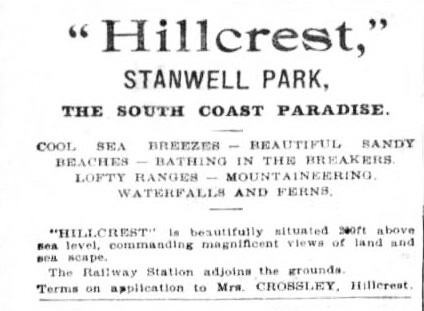 Matthew Gibbons (1765-1835) was granted 1,000 acres in 1832 from Stanwell Park to Coalcliff. The property was purchased by Sir Thomas Mitchell in 1840 and in 1872 Justice John Fletcher Hargrave acquired the property. When Hargrave died in 1885, his land was distributed between his children. His son, Lawrence eventually became the owner and lived at 'Hillcrest' between 1893-1899. Thereafter, it was a guesthouse until 1939. Lawrence Hargrave created and tested many of his monoplanes and cellular kites while at 'Hillcrest'. The 13.5 acres (5.5 hectare) estate remained in the Hargrave family until 1940, when it was purchased by Colin Campbell and his wife, Margaret. During World War 2, the basement of the house was used for a time to accommodate soldiers. 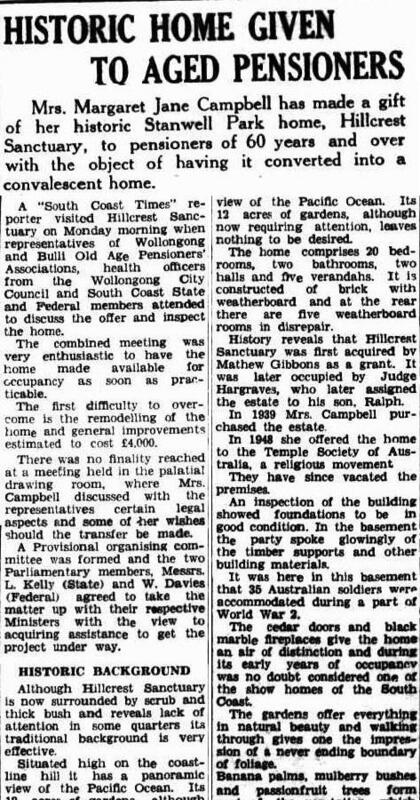 In 1945, the Campbells offered the property to the British Orphan Adoption Society (Illawarra Mercury 25 Jun 1945 p4). The offer was not accepted. In 1946, the Campbells announced that they intended to donate the house and 12 acre property to the United Protestant Alliance which it would use it as a Home for Boys, and little cottages in which aged couples may live out the balance of their lives in congenial surroundings, free of financial worry. (Kiama Reporter 18 Dec 1946 p6). That too came to naught and when Mr Campbell died in 1947, his wife was still seeking a suitable group to accept the property. 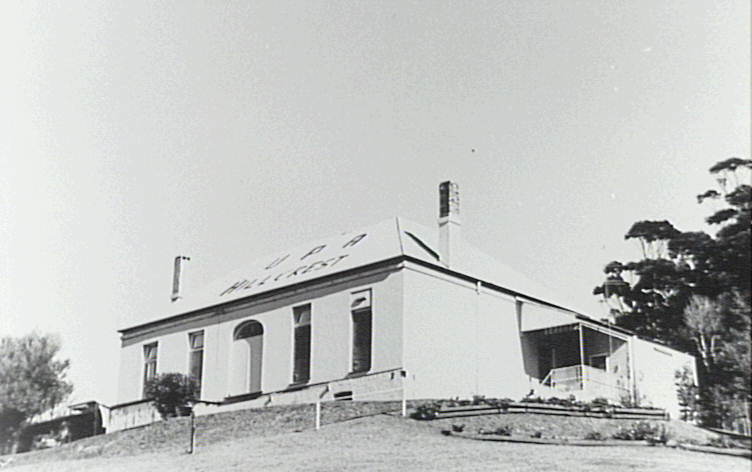 In 1948, the property was offered to the Temple Society of Australia who accepted it and the property became known as Hillcrest Sanctuary. 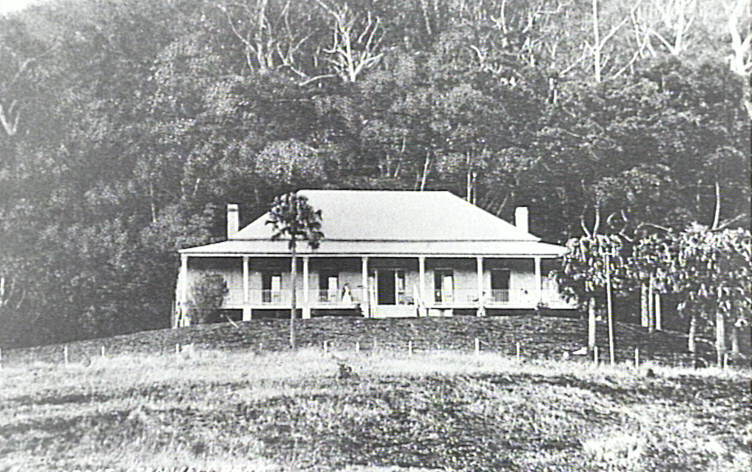 In December 1951, she transferred the property – then known as Hillcrest Sanctuary, to the State Government by a deed of gift. The house was to be used as a convalescent home but was not to be used as a museum or memorial to Lawrence Hargrave. Hillcrest homestead is a single storey residence of a colonial Georgian design, made from stucco covered bricks. It has an iron roof, the interior wood is cedar and the fireplaces are marble. The house was subjected to a series of alterations over the years by the Campbells and later the UPA. By 1981, the house was in very poor condition and had been deprived of its verandahs and some of the weatherboard sections. The UPA renovated the house, demolished the cabins and engaged Zadro Constructions to build 6 duplexes and 2 apartment buildings, totaling 24 independent living units.